When white settlers moved to Southern California, they transferred European and eastern American architectural ideas to both civic and residential buildings. 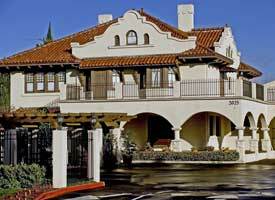 After a few decades, residents sensed the incongruity of constructing Cape Cod and Colonial Revival buildings in a Mediterranean and semi-desert landscape and turned to what was viewed as a more authentic design: the Mission Revival style that drew inspiration from the early Spanish missions in California. The Mission Revival style replicated the materials and details of California mission churches of the 18 th century, such as tiled roofs, curved parquets and gables, bracketed eaves, and arched arcades. The Mission Revival style originated in Southern California and was the first architectural style to diffuse eastward from the west coast. The style was popular from 1885 to 1915, and numerous residential, commercial, and institutional structures were constructed, displaying this instantly-recognizable architectural style. 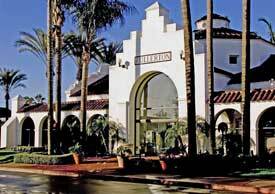 The style was also adapted by the Santa Fe and Southern Pacific Railroads for their train stations, resort hotels, and other rail corridor buildings. 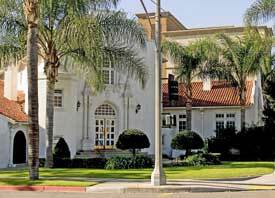 The best known architects for Mission Revival style residences are Lester S. Moore and Sumner Hunt. The first great Mission Revival building was the California Building at the 1893 World's Columbia Exhibition in Chicago. The best-know Mission Revival building in California is the Riverside Mission Inn, which is also the largest Mission Revival building in the United States. 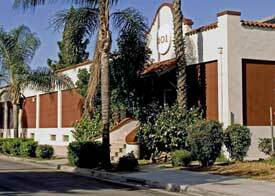 Fullerton residents quickly adopted the style and continued to its use into the 1920s. Although many Mission Revival buildings were demolished over the years, the buildings that remain show the decorative ways that the Mission style was used in the city. Impressive application of the style can be seen in the Hale House (1908) at 2025 E. Chapman Avenue, now called the Ivycrest Montessori Private School; the John Hetebrink House (1914) at 515 E. Chapman Avenue; the Elephant Packing House (1924) at 201 W. Truslow Avenue; the Christian Science Church (1920), now the Self-Realization Fellowship Church, at 142 E. Chapman Avenue; and the former Fullerton General Hospital (1913) at 201 E. Amerige Avenue, now used as a social service agency. Two of Fullerton's train depots, now used as restaurants - the Pacific Electric (1918) at 136 E. Commonwealth Avenue and the Union Pacific Depot (1923) now at 110 E. Santa Fe Avenue (moved from 105 E. Truslow Avenue) - were also constructed using the Mission Revival style. 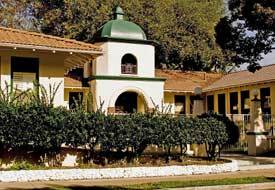 After World War I, architects and builders abandoned the Mission Revival style in favor of the more sophisticated Spanish Colonial Revival style and European architectural revivals. Early, James. Presidio, Mission, and Pueblo: Spanish Architecture and Urbanism in the United States. Dallas: Southern Methodist University Press, 2004. McMillan, Elizabeth. 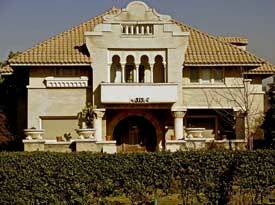 California Colonial: The Spanish and Rancho Revival Styles. Atlgen, PA: Schiffer, 2002. Sagarena, Roberto. "Building California's Past: Mission Revival Architecture and Regional Identity." Journal of Urban History28 (2002): 429-444. Weitz, Karen J. California's Mission Revival.Los Angeles: Hennessey & Ingalls, 1984.